Tetraspace (four dimensional space) is a fascinating place. Events that would be bizarre and mind-bending to us puny little realmic beings would be common-place and taken for granted in tetraspace. Jumping straight into thinking about tetraspace is enough to boggle any human mind. An indirect route must be taken if there is any hope of understanding the possibilities of tetraspace. The method I use here is the one pioneered by the books Flatland and Sphereland, and is the one used in just about every other text about the fourth dimension. First, the I tell of the adventures of a planar being (a two-dimensional being) attempting to understand realmspace. Going from planespace (two-dimensional space) to realmspace will shed light on how to conceptualize going from realmspace to tetraspace. While going from planespace to realmspace may seem overly simple, it is necessary to understand exactly what is happening so that you can understand the process of going from realmspace to tetraspace. Just as tetraspace is mind-boggling to us realmic beings, realmspace is mind-boggling to planar beings. Things we take for granted are extremely difficult for planar beings to conceptualize. The only thing a planar being can see of our realmic objects is their planar cross sections in his planespace, and the effects of them rotating. At first, he will only be able to conceptualize the effects in planespace of realmic objects. He will only see planar objects in his mind. Eventually, with much deep thought and introspection, he may be able to conceptualize the realmic object itself. Similarly, when starting to think about tetraspace, we will only be able to conceptualize the effects of tetral (four-dimensional) objects in realmspace. We will only be able to see realmic objects in our mind at first. But, by the effects we see, we can carve a sculpture in our minds of how the full object really looks like, and conceptualize the whole of the tetral object. 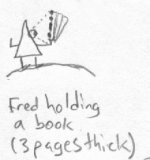 Unfortunately for Fred, he can't see backwards - he can only see forwards. It is impossible for him to simply spin around and face the opposite direction. It is easy for beings in realmspace to face a different direction because they can just spin around, left or right. The only way for beings in planespace to face a different direction though is to turn their head down and heels up. Fred either has to stand upside down to be able to see what is behind him, or he has to walk backwards blind because he only has an eye on his front side. Fred also understands what a circle looks like. It can be imagined as a series of lines stacked side by side in the way that a square is formed, but the lines start small and expand to a certain size, then shrink down again at other side.